Ferruccio Mengaroni’s ideas were always big. Almost a century before the giant lipsticks and hamburgers of Pop artist Claes van Oldenburg, he was making larger-than-life objects using ceramics. There is a giant crab in the Castello Sforzesco Museum in Milan, and a large Medusa in the Pesaro Museum, that possibly represent the pinnacle of his career. Which had started many years before. A restless and prolematic child (born on 12 October 1875), his father had secured him an apprenticeship with the ceramist Molaroni, Pesaro, probably out of desperation. 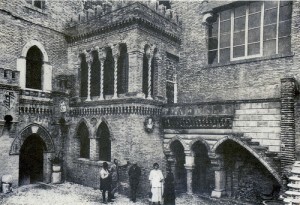 Young Ferruccio spent 12 years there – from when he was 12 to 24 – learning all that he could about clay, glazes and firing. He was also a great experimenter. He threw all sorts of materials into the kiln with his pieces, and, whether by design or chance, he discovered a way of creating pieces with a very antique-looking patina. Repro Renaissance pieces were all the rage at the turn of the century, but Ferruccio found that he could earn much more by passing off his pieces as genuine 16th century. There are probably still some of his majolica plates in various museums of the world; just one of the documented incidents concerns the Fitzwilliam Museum in Cambridge that purchased such a piece in 1926, only to discover its real origin some years later. 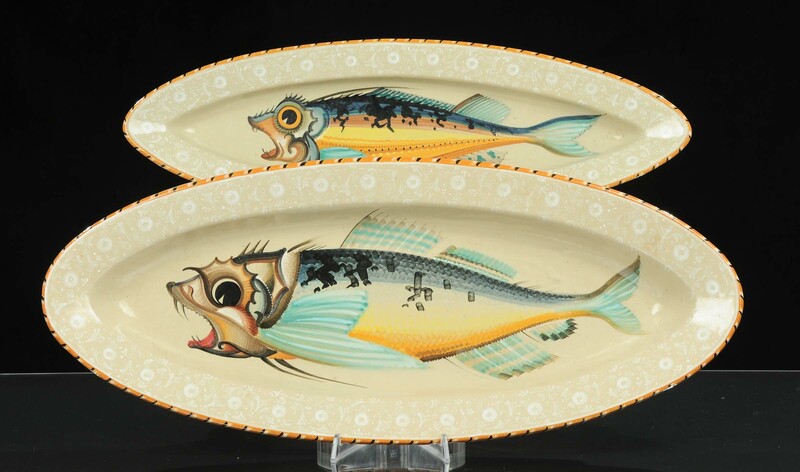 But it seems that he made his forgeries only between about 1900 and 1910, possibly to help finance his new factory in Pesaro, making fine tableware. In 1915 he opened his ‘Studio delle Ceramiche Artistiche’ in Pesaro, with the trademark of a rampant griffin and the initials SDCA, and sometimes MM, standing for Mengaroni & Mancini (the latter was his friend with whom he set up his ceramics studio). He married and had children, and his family life was relatively happy until he discovered that his wife had had the children bapized, in great secrecy. She was Catholic, he was atheist. When he found out, things were never the same again, neither with his wife, nor his children. The excellence of his factory’s ceramic products made him a famous figure in Pesaro, and brought him to the attention of the young crown prince Umberto. When a royal visit was planned to the city in 1923, Umberto wanted to visit Ferruccio at the factory. But Ferruccio had made no secret of the fact that he was an avowed anarchist, and court advisors tried to dissuade Umberto from any contact with the ceramist. Not surprisingly, because Umberto’s grandfather, king Umberto II, had been shot and killed by an anarchist in Monza (near Milan) in 1900. But in actual fact, the visit was a great success, and Ferruccio apparently got on quite well with Italy’s future, and final, king. But what Ferruccio really wanted was not fame in society or as an industrialist, but the everlasting fame that can be given by art. 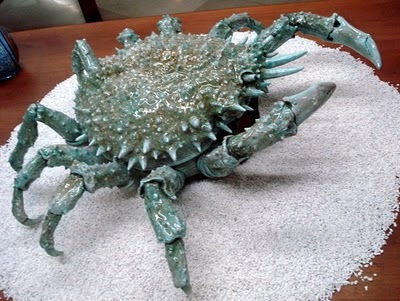 He was convinced of his skill as a sculptor, and he used his prowess as a ceramist to create his gigantic animals and crustaceans. He applied his experience with glazes to give his surfaces a life-like diversity, vibrant with countless subtle variations in colour. 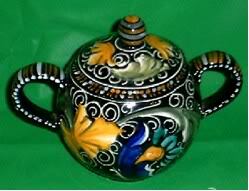 Those who were unable to appreciate the abstract beauty of his pieces would, he thought, be convinced by their size. 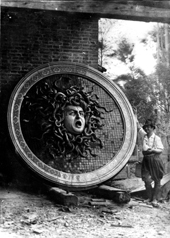 The opportunity to exhibit at a national exhibition to be held in Monza fired his imagination, and he began working on a colossal ceramic sculpture, a Medusa, the warrior with hair made up of intertwined serpents. The theme was a classic in art, with illustrious precedents including Leonardo da Vinci (a youthful work, since lost, painted on a shield) and Caravaggio. Ferruccio decided that the central face would be a self-portrait, and spent long hours in his studio, pulling faces in a mirror, sketching rapidly in order to immortalize his own features in as repulsive a guise as possible. Undeterred even by the mirror falling to the floor and breaking into a thousand pieces, he completed and fired the piece, and had it packed into an enormous circular case made of timber. He was waiting at Monza when it arrived, on 13 May 1925. 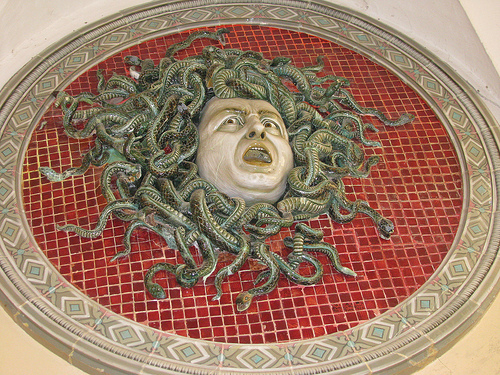 He was convinced that his Medusa would be the piece that would win him his rightful place in the realm of art and artists, so that he would be revered and remembered forever after. He had forewarned the exhibition staff of the size and weight of the sculpture, and so they had prepared a ramp that would enable the circular case to be rolled up the steps leading to the hall in which it would be installed. 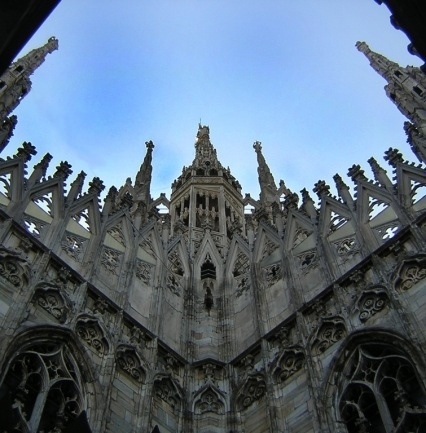 Ferruccio watched tensely as the workman began to haul the case up, straining against the weight of well over a ton. When it had reached halfway, the sound of dry cracks from one side of the wooden ramp preluded impending disaster. The massive wooden plank gave way, and the case lurched to one side. The workmen pulling from above were caught off guard and the canvas webbing straps were snatched out of their grip as the case started to roll backwards. The men pushing from below dodged out of the way and fled like frightened rabbits. Only Mengaroni remained, leaping towards the case, his arms outstretched as he tried to halt its downward acceleration. The workmen watched aghast as the case toppled and rolled, lurching downwards towards the balustrade. A moment later, it had come to a relatively gentle stop, cushioned by the body of Ferruccio. He was killed instantly. The work inside survived intact. So, in a way, Mengaroni achieved his ambitions for lasting fame. 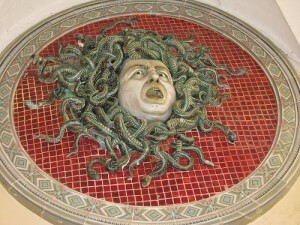 By his death, the Medusa with his own face lived on. The accident was widely reported all over the world. Some commentators were struck by the ‘sublime gesture,’ the artist who fearlessly stepped forwards to protect his own work. Others remarked on the symbolic aspects: the artist crushed by his own ego, and the fact that the artist’s image lived on thanks to the death of its creator. But Mengaroni’s ambitions for lasting fame were not fulfilled. Today, he is a very obscure figure. Some ceramics collectors know of the story and look for pieces bearing the emblem of his factory, which had become ‘M.A.P. 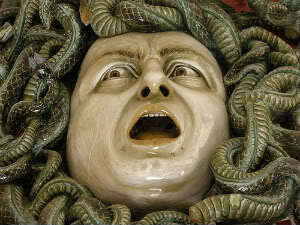 Maioliche Artistiche Pesaresi.’ Today, you can see his large marine crab at the Castello Sforzesco Museum in Milan, and the murderous Medusa at the Musei Civici in Pesaro, Piazza Toschi Mosca 29. It has been affixed to the wall in the courtyard. A suggestion: don’t stand right underneath it!